Yesterday morning I offered a Nuptial Mass for a couple. By happy coincidence, they chose to be married at my home parish where I received all of my sacraments and offered my First Mass. Before the Mass, I walked from the sacristy, down the narrow hallway to the side chapel. Just walking down that hallway--used for storage of typical liturgical items (kneelers, chairs, etc) filled me with a great sense of gratitude and nostalgia. I've walked down that hallway hundreds and hundreds of times in my life, passing the very same kneelers and chairs that were there 40 years ago. There was something about serving the 7am Daily Mass. It was dreadful to be dragged out of bed as a boy to go serve. During most of the year, you'd probably get assigned to the Seven only every few months. You'd be assigned for four Mondays or Tuesdays or whatever. But during Lent, there was an almost contest to see which of us could attend the most Masses. Some days during Lent there would be seven or eight of us serving a Daily Mass. Most of those Masses were spent less listening to the homily and more plotting how to get to the bells ahead of any of the other altar boys when the time came. In the fight for the bells, there was more than a few instances of bells sounding at the wrong time because two of us were fighting for control. An icy stare from Fr. Reilly brought that to a halt. The sacristy was quiet in the morning before the Seven. Occasionally before the priest arrived I'd be sitting up on top of the vesting case. If Fr. Heery, the pastor, had the Mass, he'd come in and say, "We're not at the ballgame." That meant, "Get off of the vesting case and sit in a chair." At Seven, we'd walk down that long, narrow hallway, out into the chapel sanctuary, and the Mass would begin. The Seven probably had a good 130 people each morning and many more during Lent. That chapel, dedicated to Our Lady, had a significant impact upon my life. "Small" funerals (those with less than a hundred people) were often in the chapel. Being an altar boy meant getting out of school to serve funerals. That was the best thing ever. There was an old sacristan named Stanley who would set up for funerals. After the funerals, as a way of delaying going back to school, we'd offer to help Stanley do various chores. When we'd show up back to school late, we'd explain to the nuns that Stanley had delayed us. On Sunday evenings during Advent and Lent I'd serve Evening Prayer and Benediction in the chapel. Whenever I pray the psalm of Sunday Evening Prayer, "You are a priest forever like Melchizedek of old," I hear the voice of our old pastor, Fr. Heery. 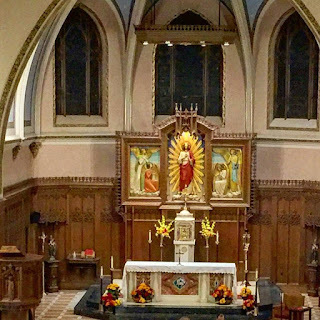 On Monday nights, I'd serve the evening Mass which ahead of time involved the praying of the Rosary and the prayers for the Miraculous Medal Novena. At the end of the Mass, there was always the veneration of the relic of St. Catherine Laboure. A lot happened in that chapel. Among other things that chapel had daily adoration. Located along a very busy city street, walking into the chapel was like walking into a refuge. As the heavy wooden door of the chapel closed, it crushed the noise from outside with incredible silence. That chapel, with it's constant exposition of the Eucharist, became the heart of that parish. All day long, people stopped by for "a visit." There were many great things about that parish. A convent full of nuns, five priests, a packed school, parish shows, spaghetti dinners, Christmas fairs etc. It was a place of friendship. It was a normal part of life. The kids I hung out with, played with, got in trouble with, got in trouble with, got in trouble with, were all from the parish. It was a place where we spent a lot of our life. Being Catholic was not something just for Sundays. It was part of everything. All the normal stuff of life happened in relation to the parish. It was a great place to grow up. 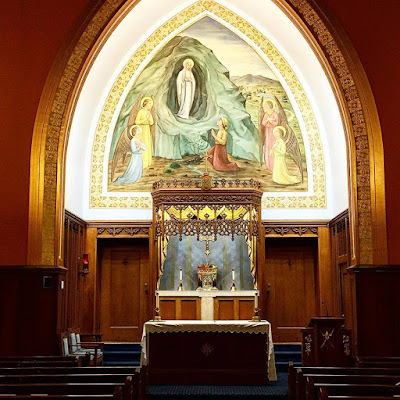 When I walked into the chapel yesterday (and happily saw how well the new pastor has beautified it), I was filled with gratitude for all of the formation that I received there. At the time, I didn't really understand that I was being formed. It was just normal life. And yet now, looking back, I realize that Our Lady who looked down upon all of us as we lived our lives of Faith there, was interceding for us and drawing us closer to the Heart of her Son. True renewal of parishes and persons originates at the Altar and leads to the Altar. There were many great things that happened in that parish, but they all began and culminated at the end of a narrow hallway, at the Altar where God saves and renews the world.